With waste yarn and crochet hook, make a loose chain of about four stitches more than you need to cast on. 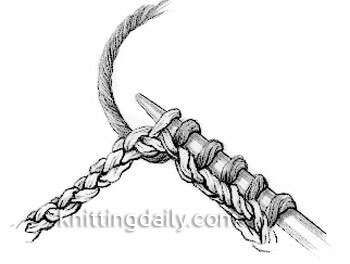 With needle, working yarn, and beginning two stitches from end of chain, pick up and knit one stitch through the back loop of each crochet chain (Figure 1) for desired number of stitches. Work the piece as desired, and when you’re ready to work in the opposite direction, pull out the crochet chain to expose live stitches (Figure 2).